Easy on the cook but big on flavor! 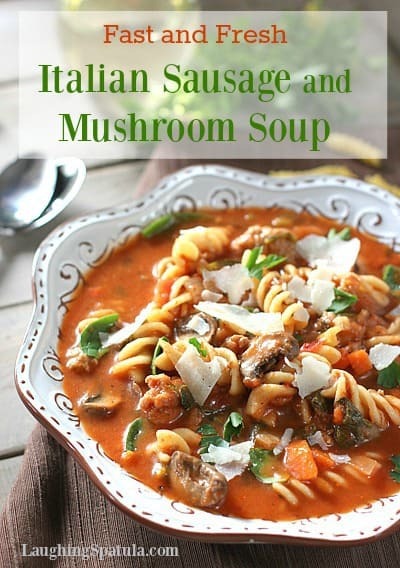 This quick making Italian Sausage and Mushroom Soup is a great ‘clean out the fridge’ meal! Fast, Fresh and Healthy! You can whip up a big batch of this soup and feed your family for a few days with a enough left over for lunch! Plus..it’s got a secret ingredient. Over the years I have gotten in the habit of cooking a large pot of something on Friday nights to avoid having to cook over the weekend. I cook ALOT during the week and need the break to recharge my culinary creativity :). This soup has a secret weapon. Store bought marinara sauce. Pretty darn brilliant if you ask me! 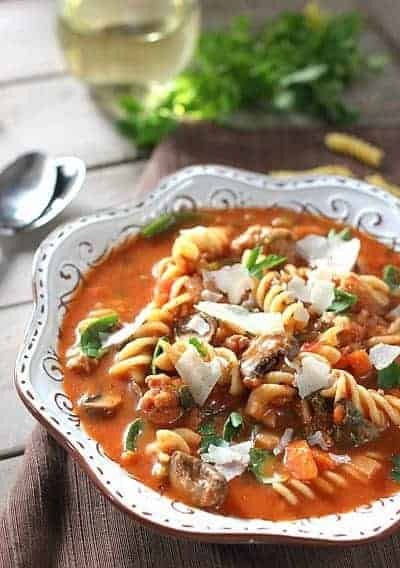 It turns the soup into an Italian wonderland of flavors. I love the Trader Joe’s Organic, no salt added stuff, but whatever you have on hand will work. Better quality marinara means a better soup. Same goes for the sausage. I used chicken sausage, which I always do. I like that it isn’t too fatty but gives you all the flavor of a good pork sausage, but again, if you have a fave…use it! Super simple Italian Sausage Soup with Mushrooms has tons of flavor but doesn’t require a whole lot of ingredients. Hello weekend freedom! Still looking for soup? Check out my Gnocchi, Sausage and Spinach Soup! Another Fast and Fresh recipe with great big flavors! 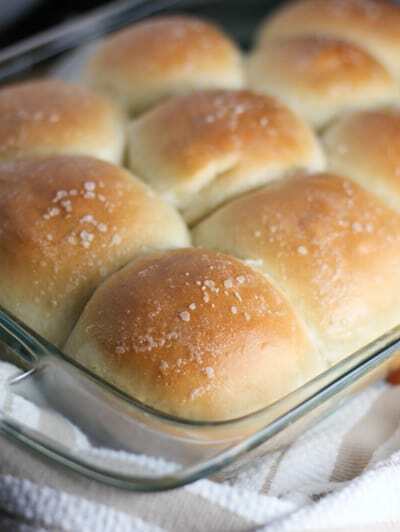 This soup would be sooooo good with my easy, one rise, practically make themselves, Homemade rolls! A 20 minute soup that is big on flavor! Add garlic, mushrooms and parsley. Saute for 4-5 minutes until garlic is fragrant and mushrooms are tender. Add marinara sauce and chicken stock. Add rotini noodles and continue to cook for 8-10 minutes or until pasta is tender. I love italian sausage in a soup. This one looks delicious! Thanks Linda! I’m making this again on Sunday, it was so good! Thanks for the note Sam! This looks fantastic. I love making soup in the winter, it’s a great way to warm up from the cold. I will have to try this! Thanks Kit! Hoping you get a chance to try it! Wow! This soup looks absolutely scrumptious! 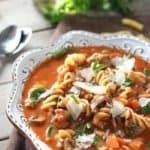 I LOVE pasta, so this soup is on my “must try” list! Thank you for your note Tania! 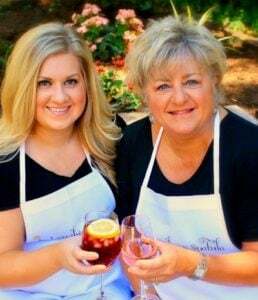 Thank you Sherri! Photo compliments are much appreciated…it’s such a work in progress!